How does the woman who literally wrote the book on marketing to women feel about the changes in the industry over the past 10 years? Marketing To Women and PrimeTime Women author and TrendSight Group founder Marti Barletta was interviewed on this topic by Snippies on site at M2W, April 13 & 14, 2011 at the Chicago Cultural Center. 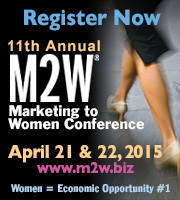 We’ll be posting additional video from M2W every few days, so be sure to check back for more great interviews!